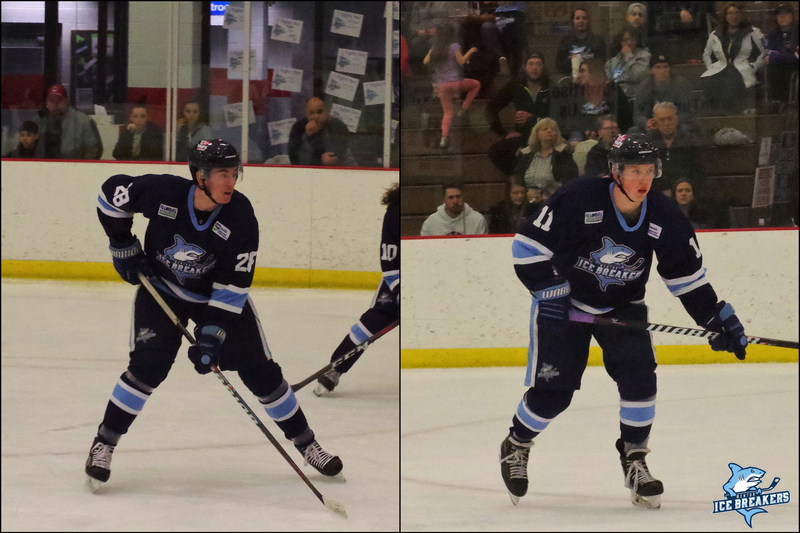 Defenseman Tommy Mahoney and forward Parker Moskal are two productive players who were acquired by the Ice Breakers in mid-season trades. Mahoney, 24, hails from Baintree, Massachusetts. During the 2013-14 season, he racked up 64 points (25-36-64) over 41 games with the Boston Jr. Bandits in the MetJHL before beginning a four-year collegiate career at Assumption College (NCAA Division III) that saw him appear in over 100 total games and earn a Second Team All-Conference nod as a senior. Mahoney began the year with the Watertown Wolves before playing 26 games with the Carolina Thunderbirds. 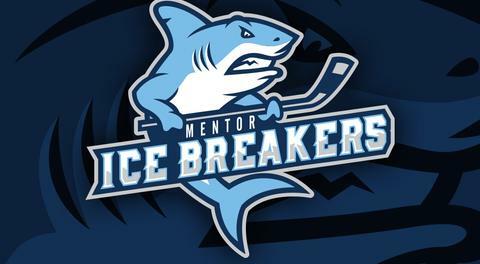 Since joining the Ice Breakers, he has four goals and nine assists for a total of 13 points over 16 games and has been a physical presence with an imposing 6-foot-4, 205-pound frame. Moskal is a 21-year-old center out of San Diego, California who brings four years of experience at various levels of junior hockey. He spent the most time in the WSHL and put up a 31-37-68 scoring line with the Long Beach Bombers last season. Moskal, who stands at 6-foot-2 while weighing in at 195 pounds, has had plenty of big moments in his brief time with Mentor, including the game-winning goal to cap off his first career hat trick in the Ice Breakers' come-from-behind 8-7 win over the Danville Dashers on March 10. Tommy Mahoney: I played with Carolina for most of the year before I was traded to the Ice Breakers about a month-and-a-half ago. I've been with the team ever since then. Parker Moskal: I was traded here from the Elmira Enforcers. TM: I haven't been on the team most of the year, but I definitely think we've made some huge strides as a team as the year has gone on. I think there's a good foundation in place for a successful team moving forward. PM: It's been exciting here for the last few wins and it's going to be exciting to see what the Ice Breakers do in the future. Q: Tommy, what was your initial reaction when you were traded to the Ice Breakers in February? TM: I was excited and eager for a new opportunity to play and a new city to experience. Q: Parker, how does the level of play in the Junior A WSHL, where you played last year, compare to the level of play in the FHL? PM: This league is definitely much more physical and a lot faster. Much less finesse than the WSHL. TM: I would definitely say my time at Assumption College, where I played for four years. I was able to accomplish a lot including earn my college degree, play hockey, and win a championship. I made some great friendships that I'm very thankful for. PM: It's a toss-up between Mentor and my time in Rapid City when I played for the Rush. TM: Mentor is a great place to play. The city itself as well as the arena and apartments have all exceeded my expectations. I'm definitely happy to have landed here. PM: Really enjoying my time here! The people around town are awesome, there's lots of locally-owned great places to eat, and our fans are second to none. Q: Parker, what's allowed you to have so much success this season with 19 points in just 12 games? PM: A lot of help from my teammates and a lot of hard work. TM: I think of myself as a complete all-around hockey player. 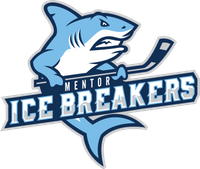 I've played forward my whole career, but with injuries I've stepped into a role as a defenseman for the Ice Breakers. I take a lot of pride in my ability to be a good player on the offensive and defensive sides of the puck as well as my ability to do the little things that contribute to winning. PM: I'm a skilled center who helps out on all ends of the ice and does whatever it takes to win. TM: I'm not too superstitious about my routine, but I like to get a good skate or bike ride in the gym in the morning. I like to eat some pasta and chicken with salad and take a nap before heading to the rink a few hours before the game to get ready. PM: It usually starts with a light morning skate, followed by a big lunch and a nap for a couple of hours. Then, I like to get a light meal a couple hours before game time and get to the rink to stretch. TM: My favorite player to watch would have to be Kevin Hayes on the Winnipeg Jets. I really like his style of play, and he's a bigger centerman like myself. I see a lot of similarities in the way he plays and the way I play, and I try to model my game after his to an extent. TM: I like to workout, golf, and go to the beach in my free time. PM: I love cars, hiking, reading, and just enjoying life. TM: I'd say it's a three-way tie between cheeseburgers, pizza, and steak. TM: The typical American hockey player answer: Miracle. TM: I like pretty much all genres, but country and hip-hop are probably my favorites. PM: A little bit of everything from rap to classic rock to other kinds like EDM. TM: I once dyed my hair blonde along with all my teammates for the playoffs in high school. PM: I love to cook. TM: I've been lucky enough to have been apart of a few championship teams in my career with both Assumption College in my junior year and with my junior team, the Boston Bandits. Anytime you can win a championship, it's quite a memorable feeling. PM: Scoring my first pro goal in my first pro game.